High Court Says Germany's Birth Registry Must Allow Third Gender Option : The Two-Way Lawmakers must create new rules either creating a third gender option or dispensing with gender in civil status. An advocacy group called the decision "a small revolution in the area of gender." Germany's top court has ruled that parliament must legally recognize a third gender from birth. A complaint was brought by a person identified only as Vanja, pictured here in 2014, who is intersex. 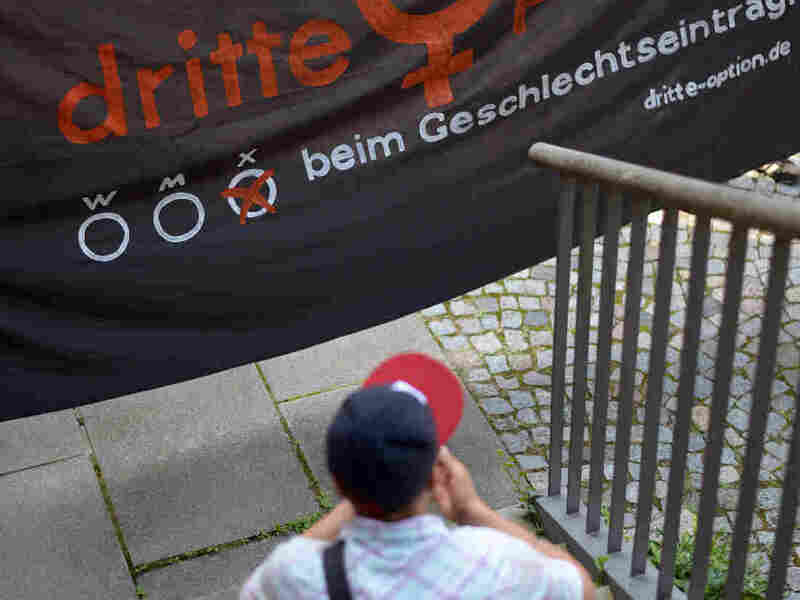 Germany's highest court has ruled that the country must provide a third gender option beside male or female in the nation's birth register — or dispense entirely with information on gender in civil status. "The assignment of gender is of paramount importance for individual identity; it usually plays a key role both for a person's self-conception and for the way this person is perceived by others," the Federal Constitutional Court said in its announcement. "The gender identity of persons who can be assigned neither male nor female gender is also protected under this right." The decision concerned a case brought by a plaintiff named only as Vanja, according to The Associated Press. The plaintiff was born in 1989 and wanted to change their entry in the birth register from "female" to "inter/diverse" or simply "diverse." Vanja's request was rejected by the registry office. The plaintiff argued this was a violation of Germany's general right of personality and was an instance of gender discrimination. The court agreed. Legislators have until the end of 2018 to come up with new rules, which the court suggested could involve either the creation of a third positive gender option, or doing away with gender entries in civil registries. The group Dritte Option advocates for a third gender option and had supported the plaintiff's case. "We are completely overwhelmed and speechless. This borders on a small revolution in the area of gender," the group tweeted Wednesday. A law went into effect in November 2013 that said that parents in Germany no longer had to select male or female when registering their babies. The new decision means there must be a third box that can be positively checked for those who identify as neither male or female — different from the 2013 law's option to select neither of two boxes. The ruling could make Germany the first European country to offer a third gender option on its birth registry, according to German broadcaster Deutsche Welle. Official documents in Australia, India, New Zealand and Nepal already recognize intersex people. An Oregon judge ruled in June 2016 that Jamie Shupe could legally change their gender to nonbinary — considered a first in the United States. And in December, what's thought to be the first intersex birth certificate in the U.S. was issued to Sara Kelly Keenan, born in New York City 55 years earlier. A California judge ruled in September 2016 that Keenan could legally change her gender to nonbinary. "I wondered if they'd actually issue it and wasn't going to believe it until I saw it," Keenan said of the birth certificate to NBC News. "It is both shocking and empowering." Germany's court recognized that it will take effort to implement the new rules. But, it said, "bureaucratic or financial burdens or organisational interests of the state cannot justify the denial of a third standardised positive entry option."